How Do I Stop Image Capture from Starting Automatically When I Connect My iPhone or iPad? By default, every time you plug your iPhone or iPad into your Macbook, the Image Capture app will be launched automatically so that you can immediately start importing new photos. While this feature may be convenient for people who often send photos back and forth between their devices, it can be a nuisance for others. Fortunately, it is possible to stop the app from launching. Most of the time, I connect my iPhone to my Macbook to sync music or to charge the device. Having to close the Image Capture app manually each time is annoying. Here is how to get rid of it. 1. Connect your iPhone or iPad to your Macbook. This action is required to access the device’s specific settings in the Image Capture app. Repeat this step for every device for which you do not want Image Capture to open when it is connected. 2. After your device is recognized by the system, Image Capture shows up on-screen. Select your device from the left panel, under the Devices section. 3. With the device selected, click the small arrow at the bottom left of the window. The arrow reveals extra settings for the chosen device. In this case, it is an iPhone. Available settings include the following: Connecting this iPhone opens and Delete after import. Because we are only interested in preventing the Image Capture app from starting, we will change the first setting. 4. Click the drop-down menu that is labeled Image Capture, and set it to No application. 5. That’s it. From now on, the Image Capture app will never bother you again. 6. 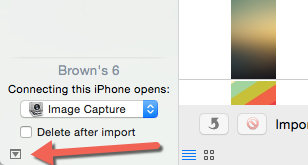 If you ever want to use Image Capture to import your photos, you can launch it manually from the Launchpad. In case you cannot find it, just type image in the search box, and the app will be shown on-screen.